“Many studies have shown the positive impact on prices for houses within proximity to new public transportation, most notably metro systems, tram, suburban railway and bus stations,” according to the latest Knight Frank report on the impact of transport corridors and urban mass transit systems on house prices. In Singapore, Stages 2 and 3 of the Downtown MRT Line have led to value enhancements of private non-landed residential developments around future stations. Prices of developments situated within 500 metrs of the future Hillview, Beauty World and King Albert Park MRT stations along Upper Bukit Timah Road (in District 21) and Rochor station (in District 7) have seen prices surpass the 20.5 percent average increase in the Outside Central Region (OCR) non-landed private residential price index, since the announcement of alignment plans for Phase 2 of the Downtown MRT Line. 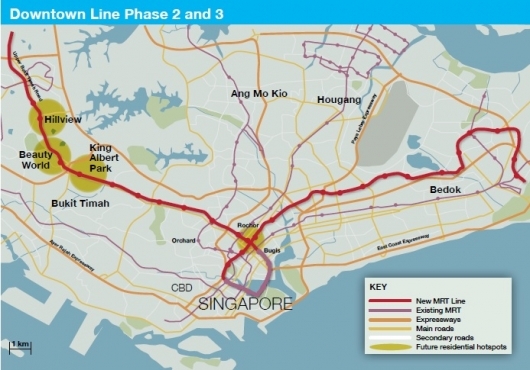 Stage 2 of the Downtown MRT Line is set for completion in 2016 and will run from Bukit Panjang through Bukit Timah, while Stage 3 covers the industrial areas of Ubi and Kaki Bukit as well as Tampines Regional Centre and Changi Business Park when it is ready by 2017. 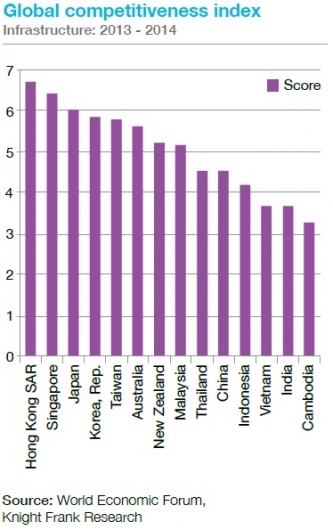 According to the Global Competitiveness Index by the World Economic Forum, Singapore ranked second globally in terms of infrastructure, with Hong Kong taking the top spot. This entry was posted in General, Property Market / Real Estate and tagged Beauty World MRT, Changi Business Park, District 21, District 7, Downtown MRT, Hillview MRT, home prices, King Albert Park MRT, private non-landed residential developments, Rochor station, Tampines Regional Centre, Ubi and Kaki Bukit, within 500 meter. Bookmark the permalink.